Download the PDF version of this page here! When considering storage rooms, wash and pack sheds with growers there is one topic that is sure to strike a nerve: RODENTS. Survive and reproduce at a temperature of 24°F if adequate food and nesting material are available. Swim as far as 1/2mi in open water, dive through water traps in plumbing, and travel in sewer lines against a substantial water current. 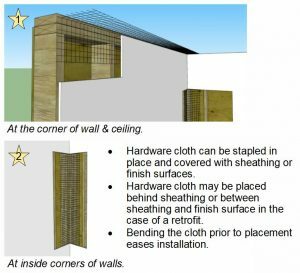 Cleanliness and Sanitation – Keep food sources well contained and sealed up, reduce “harborage” (places they can hide and live including weeds around the edge of a building), minimize available standing water. In short, make it unappealing and uncomfortable for them. 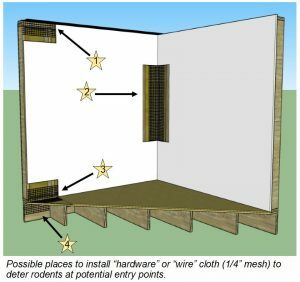 Rodent Deterrent Construction – Keep them out of the building. 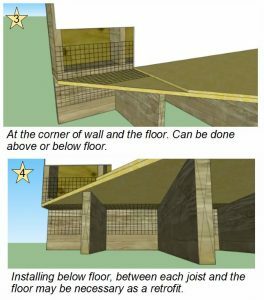 [References 1-3 provide very detailed guidance and novel, passive and relatively inexpensive construction ideas] Some examples from the references include keeping all wood products like cardboard, roots, or lumber off the ground and away from the building. Installing proper drainage with sand, stone and proper slope away from your building helps reduce moisture which can carry other pests like beetles and termites. Think about your exterior landscaping and its ability to trap moisture against the building. Keeping grass and weeds trimmed won’t leave a place for rodents to hide and travel. 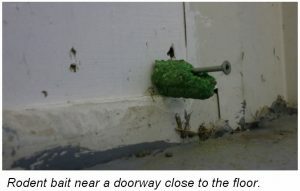 Think about all possible points of entry, sills, doors, windows, roofs. 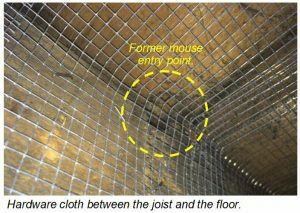 Mice can sneak into small holes and cracks so do your best to seal up all possible points of entry. Population Reduction — Bait, trap, kill. 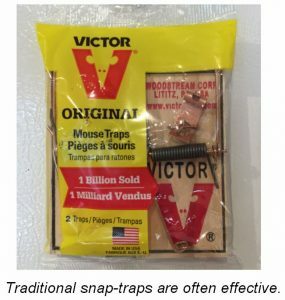 Using snap traps, sticky pads, poisonous bait are all the most effective ways of dealing with a rodent problem [References 5-7]. The following are responses from Vermont growers. These are some of their challenges and solutions related to rodents on their farms. I have had over 20% of my sweet potatoes damage by voles. Usually the largest sweet potatoes are the ones half eaten. The next year I put five “yard windmills” in the sweet potato bed, 100 ft. long, along with a half stick of gum under the black plastic by each plant – cheap gum from the discount food store. Both were done after I removed the row covers and before the vines spread. That reduced the damage to less than 5%. Very anecdotal and empirical data but worth exploring. Supposedly the voles do not like vibration of the windmill and eating the gum gives them a bellyache, if fatal I do not know. Bigger windmills, four inches in diameter and larger, with metal post seem to work better. How much gum is actually needed I do not know. A SARE grant in your future. Not the cheapest retrofit, but have had the best luck with making all walls tin or concrete, and having rat traps permanently set at every overhead door jamb, since the seal is not 100%. Ventilate with in-wall intake and exhaust fans instead of opening doors. I recently tried the tin cats and was happy. Baited them by putting small amount of oats in the trap and tilting it so the grain slid to the end where the screen was. After the mice got a few seed through the screen, they were drawn into the trap to get the remainder. Two mice in the same trap on the first night. The downside is that you have to clean out all the grain each time so it doesn’t hamper the trap mechanism. Have used Contract waxy block in bait stations for at least 4 years. Switching to a different bait because I think they are starting to get a resistance. I’ve been using that old root cellar all winter for 3 years now without any rodent problems. The process of having someone cement hardware cloth over every crack and crevice was time-consuming but really seems to have worked. I think I finally got rid of the rats in my toolshed through a combination of trapping and disturbing their nesting spots. 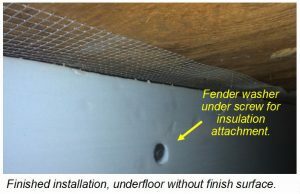 I’m curious about rodent solutions that apply to the field and high tunnel. I’ve tried to keep cats but the fishers get them. I have not had a single animal in the new barn that I built with the 12” concrete knee wall. I partly contribute the success to the fact that I do not set the bins on the ground. They are filled on the trailer and go directly from the trailer to the barn. This reduces the chance that a hitchhiker will take a ride into the barn. We are a very small pumpkin farm and don’t have the storage needs for food, but I use lots of snap traps and dump those little, dead vermin bodies while wearing a happy smile! We have only killed rats by accidentally moving a pallet onto one. Can’t bait them. They are very intelligent. Mice – kernel of corn wedged into mousetrap trigger covered in peanut butter. Rats – same as above but do not the set the trap for several nights and remove all other food sources (in chicken hutch empty all food containers) then set the trap. Putting a milk crate over the trap prevents chickens, cats, dogs from getting caught. Also works with chipmunks, and occasionally with red squirrels. Voles – hard to trap, run them down and stomp. Vantassel, S. M., Hygnstrom S. E. and Ferraro, D. M. 2012. 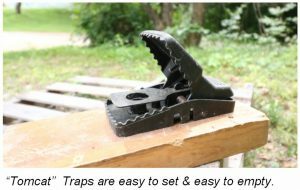 Bait Stations for Controlling Rats and Mice. Fact Sheet G1646. 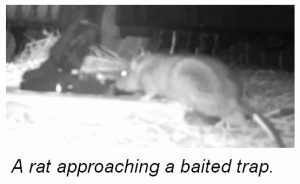 https://wildlife.unl.edu/pdfs/bait-stations-controlling-rats-mice.pdf.